So a couple of months ago Marlboro Man and I tried the meal delivery service Plated; a few weeks after trying Plated a friend of mine mentioned that he used a service called Blue Apron and was able to ‘gift’ free meals because of his subscription with the company. So my friend gifted us a box, Marlboro Man and I selected the 3 meals that we thought looked the most delicious and waited for the box to arrive. In case you were wondering we picked, 3-Chile Beef Chili with Red Kidney Beans and Pepper Jack Cheese, Tilapia Veracruzana with Yellow Rice, and Roasted Chicken with Jalapeño-Herb Salsa, Mixed Citrus & Cracked Wheat Berries. Yum!! When the box got to the house it was pretty similar to that of Plated. The packing was sturdy and insulated; the day our food it arrived it was pretty hot outside and we knew we weren’t going to be home for the devilry. 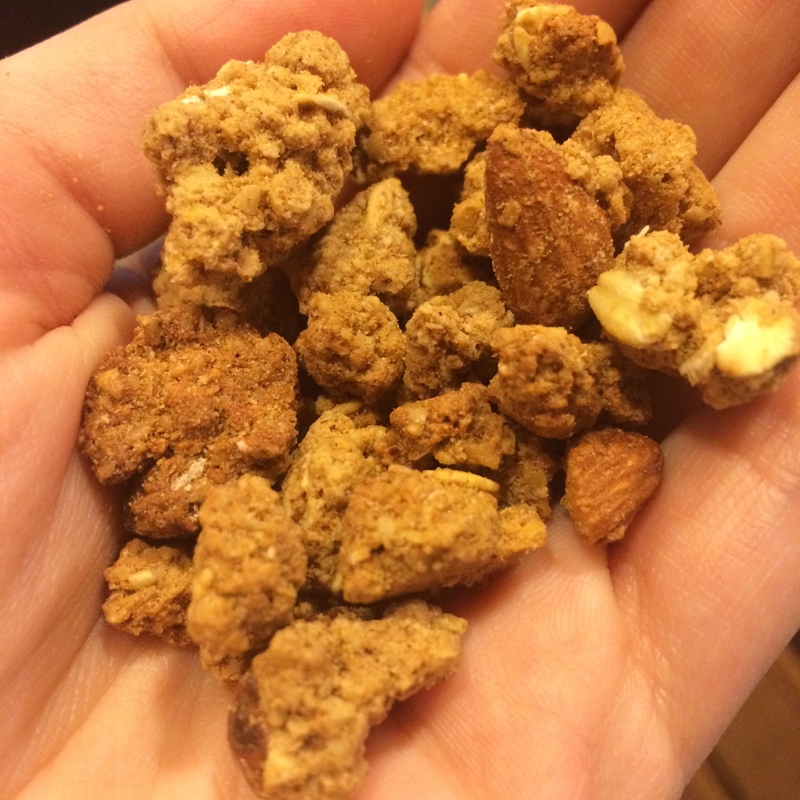 I was pretty skeptical that anything could be kept fresh in the heat that we were having that weekend, but when we got home and took the box inside everything was still cold and showed no signs of spoilage; to my surprise. 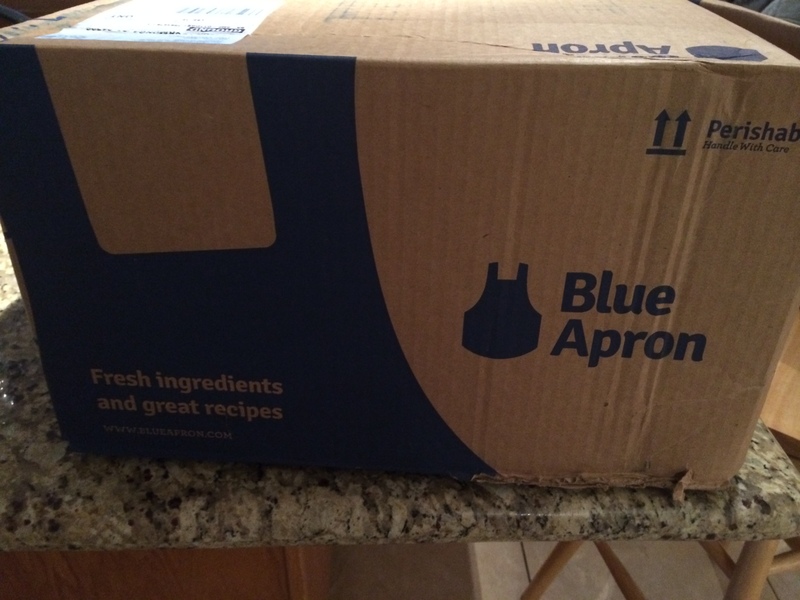 Everything was similarly packaged with the Blue Apron service. One thing that Plated did differently that I rather liked was the way they packaged the produce. Plated used those green vegetable bags that you see in the market that keep your produce fresher, longer. In the Plated bags was the produce as well as all the ingredients to complete the dish. Blue Apron kind of just had the veggies all loose in the box; with the exception of herbs and some of the more fragile veggies which were placed in ziplock bags. As I mentioned before Plated packed all the ingredients for one recipe in a green produce bag, Blue Apron had all of the odds and ends things in little brown paper bags labeled with what dish that they were for; “knick-knacks.” Blue Apron and Plated both had their meats packaged the same way; at the bottom of the box with extra ice packs or gel packs to keep the meat from spoiling. 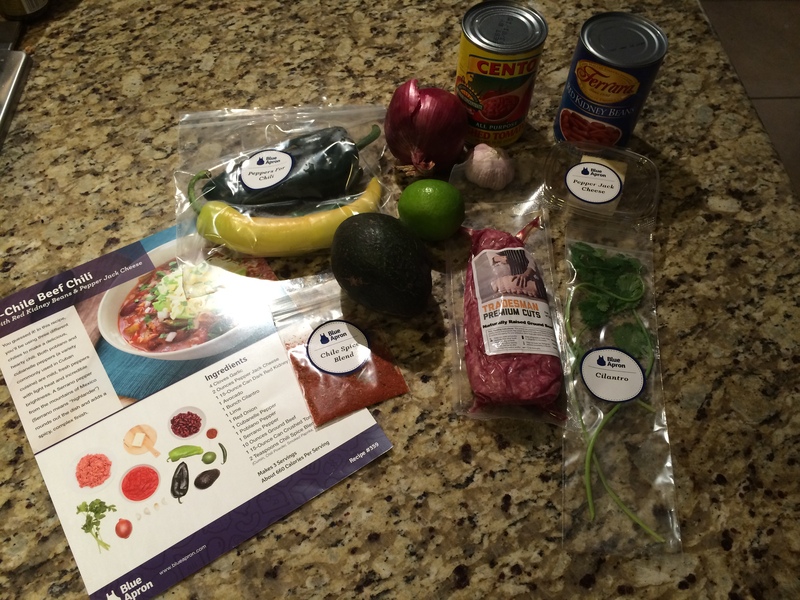 Blue Apron also gave recipe cards, which were beautiful. The Blue Apron cards were much cleaner looking, the directions were more straight forward; I messed up a recipe in the Plated box because it was simply too complex to be a single step. 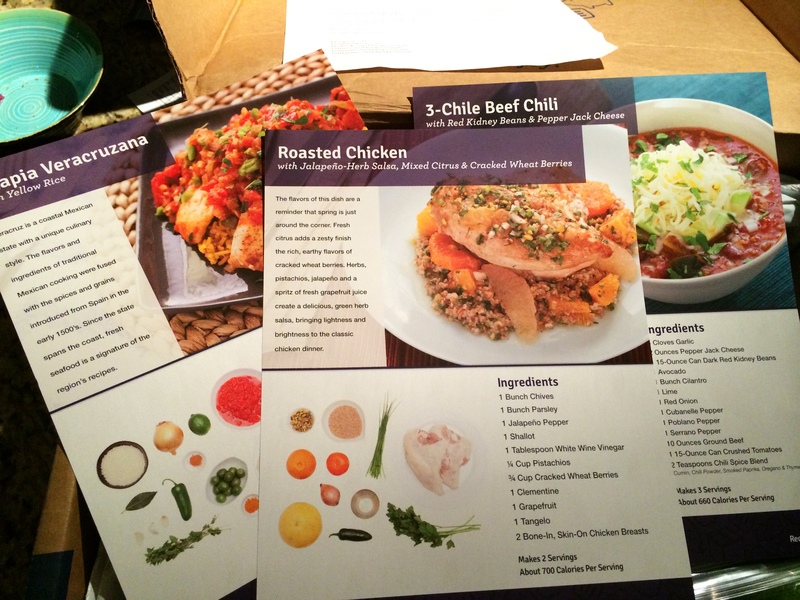 It appears that Blue Apron not only looked at the recipe in terms of ease of making, they also considered the aesthetics, weird to think that recipe cards can even be talked about in terms of looks but these were just much nicer to look at. Unlike Plated I don’t know what happened but I did not take step-by-step pictures of the process. I do however have pictures of the end results of two of the dishes; we never got around to making the Roasted Chicken with Cracked Wheat Berries. The 3-Chile Beef Chili was so delicious and seriously so simple to make, it too me maybe 20 minutes of so. 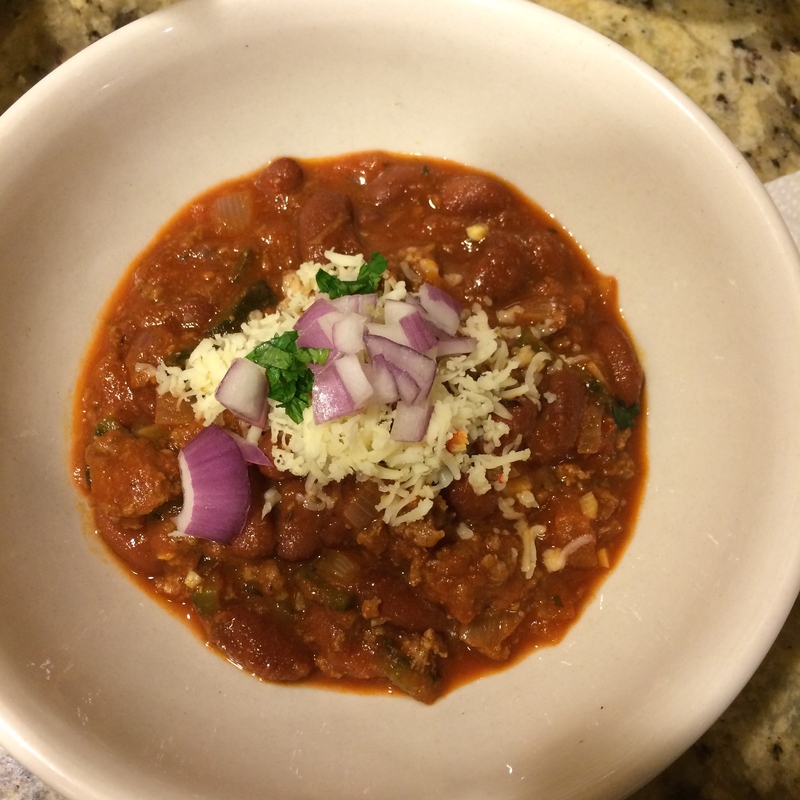 I actually made this chili again this past weekend but changed a couple of things around. Here are two pictures of the chili, unmade all ingredients from the box and then a finished picture of the meal. All of the stuff that the company sent was easily enough for 3 servings of the chili, Blue Apron absolutely did not skimp on ingredients and possibly took into consideration that people might have more than a single serving when they are eating the chili. I have to admit that the recipes in Blue Apron were much simpler and they were things that I would make again. I am not a fish eater, I don’t care for the texture and consistency of cooked fish so with that being said I have never cooked fish, ever. The fish dish was super easy to cook and the fish was very tasty; not what I was expecting at all. Blue Apron took an ingredient that maybe not all people are comfortable with cooking and paired it with common ingredients to make a very simple, yet delicious dish. 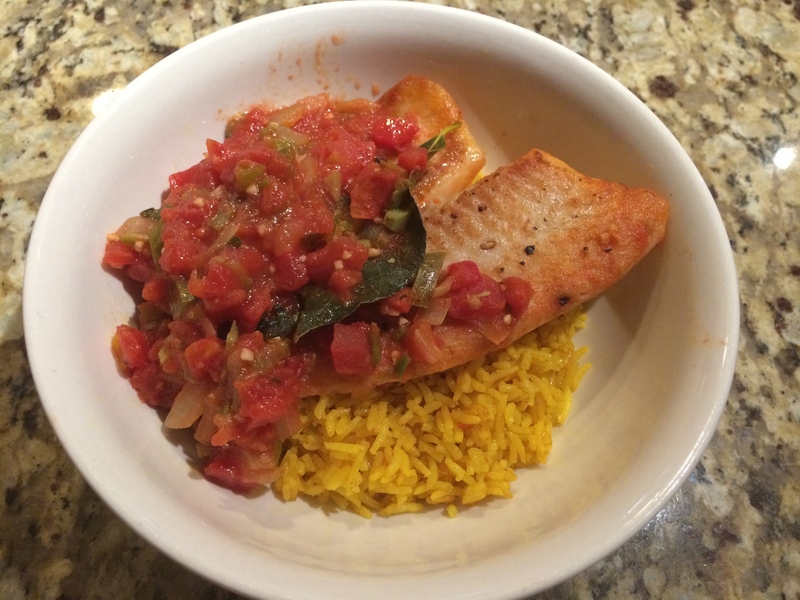 I would most certainly make the Tilapia dish again. So now that I have tried both services I can make a judgement based on my experience. If I was someone who was going to do this on a regular basis I would go with the Blue Apron service for several reasons. I felt that the recipes, although both realistic, were much more a real dinner dish concept with Blue Apron. They were things I could easily make again and feel comfortable doing so. 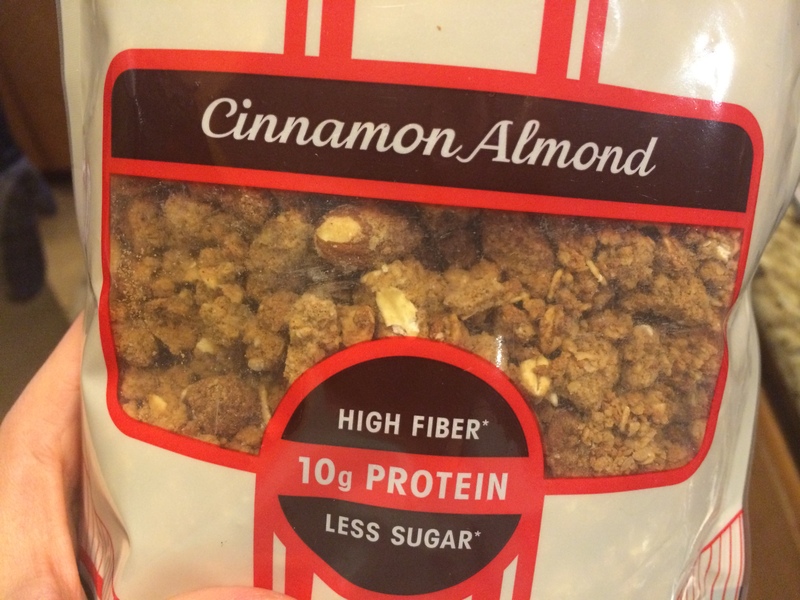 The recipes with Plated felt a little more fancy, something that you would’t do every night. Blue Apron recipes max took me 30 minutes, Plated however took me more time depending on the dish; I remember when I did the roasted chicken on Plated that took me upwards of 45 minutes. Marlboro Man and I both agree that that dishes from Blue Apron were much tastier than the of Plated. Plated dishes tasted bland, although they had spices and ingredients to make a nice flavor we both found ourselves feeling like the dish was missing something and ended up adding some other ingredients to the dishes. Blue Apron’s dishes were nicely seasoned and flavored and except for a bit of salt or pepper they did not need much else. 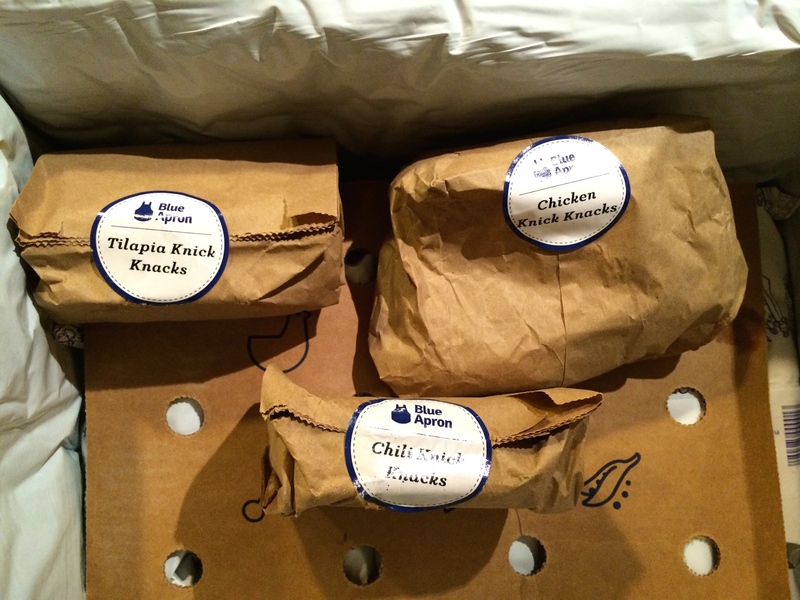 Blue Apron offers more bang for your buck. We got 3 meals, 2 plates each for free but if you paid it would have been $59.94; which comes out to about $9.99 a plate. The price per plate on Plated depended on the dish that was made but ranged from about $12-$15 per plate, if you signed up and paid a membership fee you got a slight break on the price of the plates. With the Plated service we got 2 meals, 2 plates per meal for $20 because of the promo that I used but if you were to use this service in real life it would cost around $80-$100 depending on the meals that you selected not to mention the $20 shipping fee that the company charges. For the average person Plated is just too expensive especially considering that you don’t get as many meals as you do with Blue Apron. A few more reasons why I like Blue Apron is that if I skip a week of food I am still able to get those recipes off of their website. Say for whatever reason you want to skip your meals because of financial reasons, being out of town, or whatever your reason but you see something on the site that looks like something you would like to try you have the option of getting the recipe and just flying solo with it. I think that is pretty awesome. Although we have not used either service again I do still peek the recipes on Blue Apron to see if there is anything that I want to make for dinner. Plated does not offer their recipes up for the taking. Plated charges you a membership fee to get a ‘discounted’ rate per plate. Blue Apron does not require a membership to get a better rate, all of their plates cost the same price across the board. Like I mentioned before Plated also charges shipping while Blue Apron does not. I felt that Plated had a bunch of rather unnecessary charges, maybe they need extra funding to keep their momentum or maybe they just feel that these are things they should charge; I am not really too sure, but if you are like me you like to save money where you can and as much of it as you can. 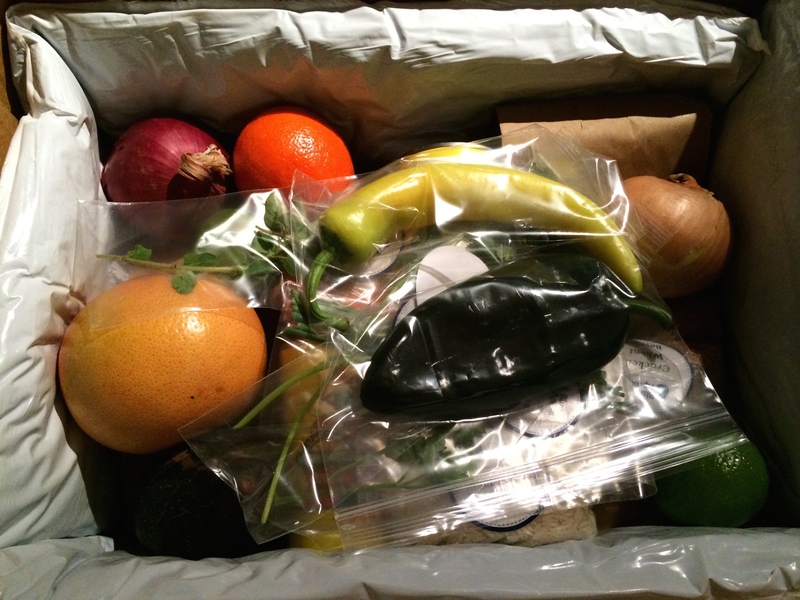 One other thing I would like to mention is that although I enjoyed using both services and clearly I favored Blue Apron of the two I wish that the companies could both figure out a way to be less wasteful when it comes to preparing the boxes of meals. 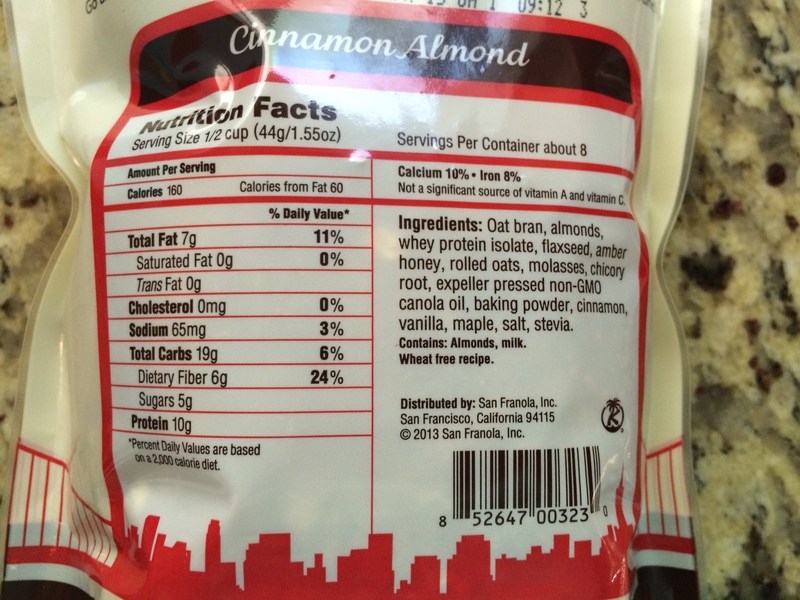 Everything is bagged separately in ziplock bags, or plastic containers, and even little bottles for items like vinegar and soy sauce. That is an excessive amount of waste, and then take into consideration that box that they ship it in. Although the box is easily tossable, all of the insulation and ice packs are things that it would be nice to be able to reuse. I would not be surprised if a third company emerges who cuts down the cost even more and is able to figure out a way to recycle the items they send out, whether it be having the consumer mail back a reusable cooler type package or even if they were to use less ziplock bags I am sure that there is a way to figure that out. Also it is worth noting that neither company paid for me to write about them, nor did they give me anything, so my opinions are solely my own and without preferential influences.